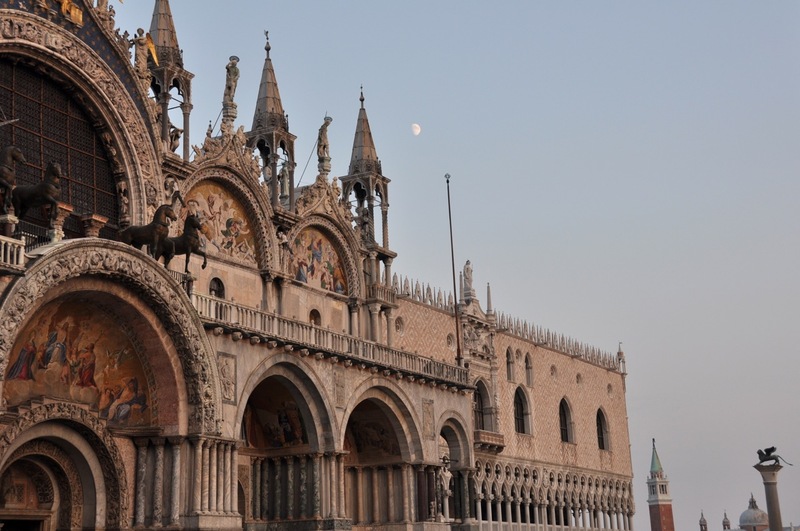 Piazza San Marco or Saint Mark's Square is arguably the most famous place in Venice. Considered to be the epicentre of the city, it is full of people and pigeons alike, and the cafes which line the sides of the square do a brisk business with tables in the courtyard occupied by tourists sipping their espressos and watching the world go by. In the rainy season, 2 feet-high platforms snake across the square to enable visitors to navigate knee high waters which flood the entire area. 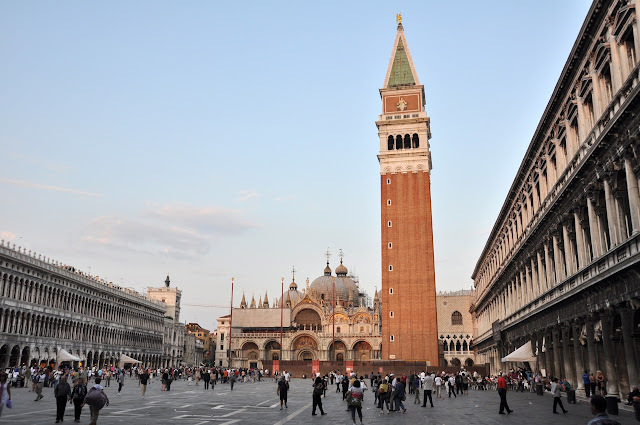 Amongst the many cafes which line the square, is a fine dining restaurant located on the second floor of the buildings surrounding the square; the only dining establishment which isn't located on the ground floor of Piazza San Marco. Ristorante Quadri is an extension of the famous Grancaffe Quadri, which is the grand dame of Piazza San Marco, having been there for centuries. 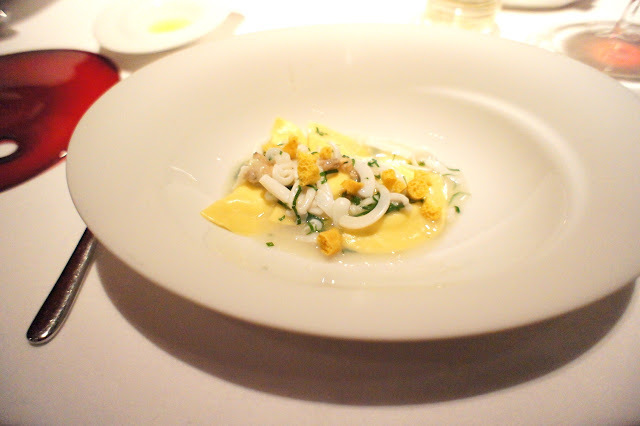 A few months ago, the Alajmo brothers of La Calandre fame (a 3 Michelin star restaurant in Padova, not far from Venice) took over Quadri and set out to impose their own vision on the venerable dining institution. The immediate impression we had when we got to the restaurant for our dinner was that the original decor was retained but some distinctive touches were added by the Alajmo brothers. The blood red silk wallpaper, antique lamps and chandeliers, the wooden cornices and beams were retained and in came Max Alajmo's distinctive wall drawings and paintings, as well as the very sensible lighting whereby each table was very well lit with spotlights but the rest of the dining room remained very dark (hence creating a sense of privacy for each table). The view out of the window was stunning. For those lucky enough to be seated at a window table, the entire Piazza San Marco was right in front and below in all its glory. We were unfortunately seated a table away from the window (the window seats were reserved a month in advance) but still had a reasonable view of the square. 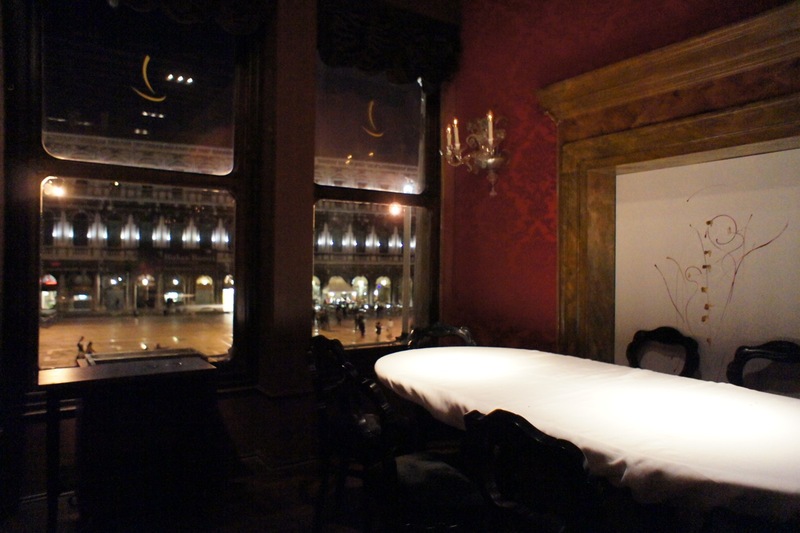 For the ultimate romantic dinner, book in advance the corner table by the window. Initially, I was very annoyed when I browsed the restaurant website and saw in the menu that they prohibited photo-taking in the restaurant. However, to their credit, when I emailed them asking for permission to take some photos (without flash and as discreetly as possible), they were fine with it provided I did so without inconveniencing the other guests. The tableware was very distinctively Alajmo, and food also showed much similarity with La Calandre if not in taste then at least in concept. The wine list was decent if not slightly pricey and I picked out a 2000 Fontalloro which was less than EUR100 and was very good for that price. 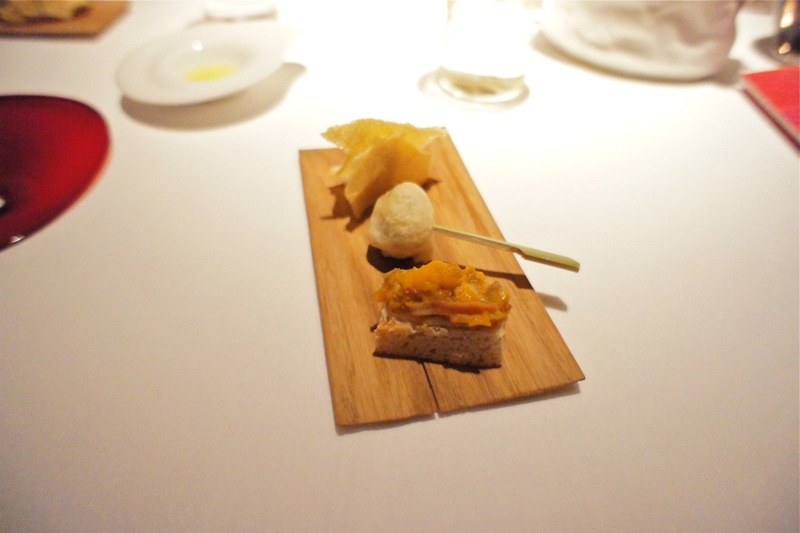 Amuse bouche was a delightful tray of canapés and a bowl of seafood cappuccino. 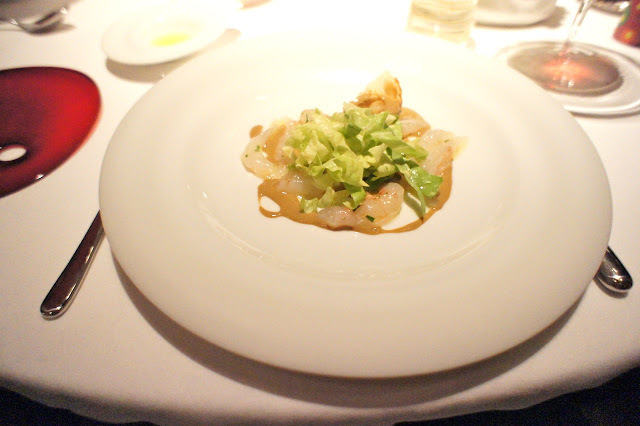 Langoustine carpaccio, olive oil, lemon and mussel clam sauce - Antipasto was a choice between the carpaccio (which I had) and the lagoon cappuccino (which my wife and sister had). 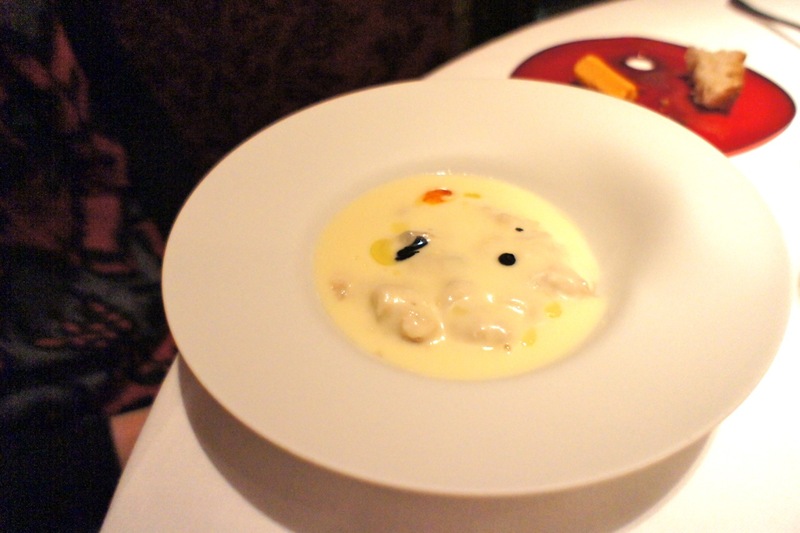 The langoustines were very fresh and the mussel clam sauce quite divine. The shredded cabbage added an interesting crunchy texture to the dish even if it did not contribute much to its taste. Cappuccino of the lagoon - as it turned out the cappuccino was not as nice as the langoustine. 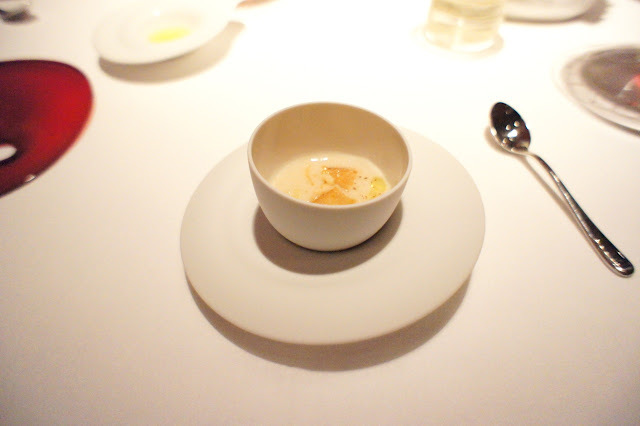 It was perhaps too creamy and heavy (especially since there was already a similar cappuccino served as the amuse bouche). Burrata cheese ravioli, clams, cuttlefish and spiced breadcrumbs - our prima piatti was the ravioli which was very light given that it was filled with burrata and was cooked in a clear clam stock. Risotto with tumeric powder, Venetian sea snails and red wine vinegar - An excellent risotto, cooked al dente and full of flavour. 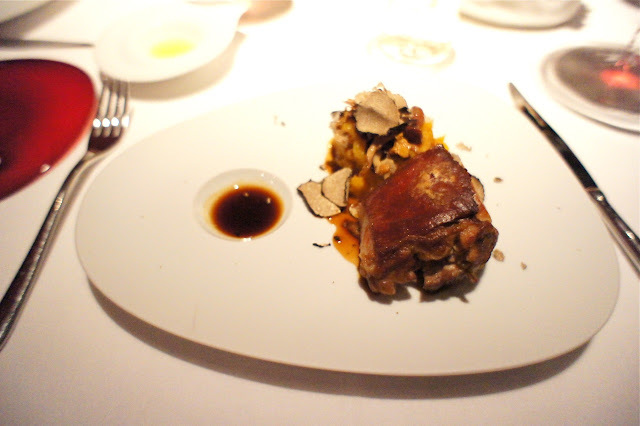 Roast suckling pig, porcini mushrooms, black trumpets, chanterelles and black summer truffles - An Alajmo special. The crispy skin was delicious and the pork cooked to perfection, retaining most of its juices. The truffles, trumpets and chanterelles (and the sauce prepared from them) gave the dish a rich earthy taste bringing to mind the Italian countryside. A very memorable dish. 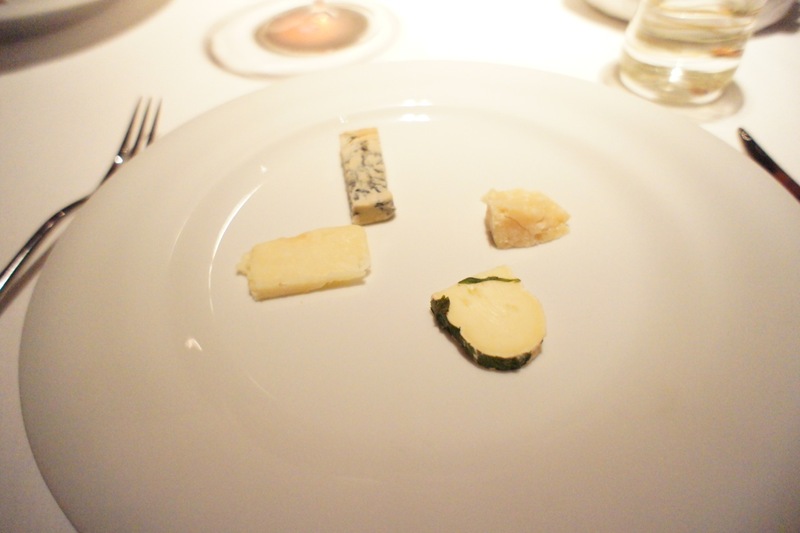 Small selection of Italian cheeses - I am not usually a cheese fan but I thought the blue cheese and the parmesan were excellent. At this point we ordered a half bottle of the 2004 Sainte Helene Sauternes which was an excellent pairing with the cheese and desserts. 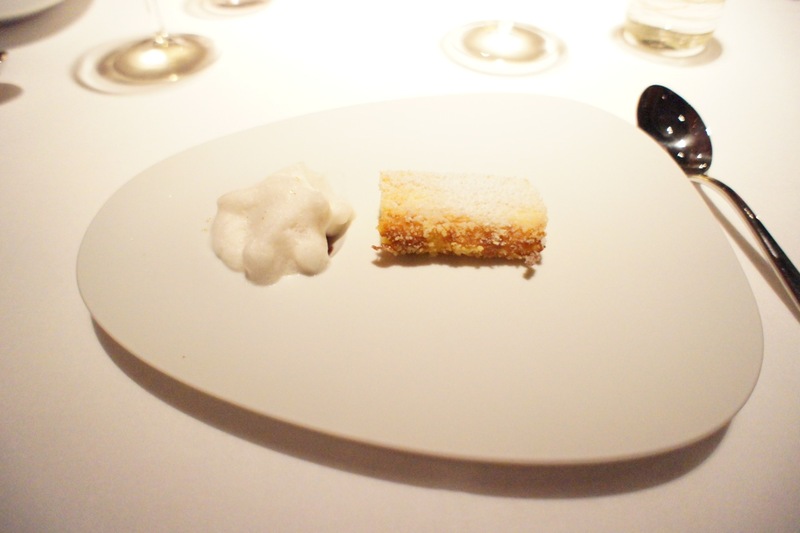 Fried cream, mixed berry sorbet and apple meringue - My wife particularly loved this dessert. 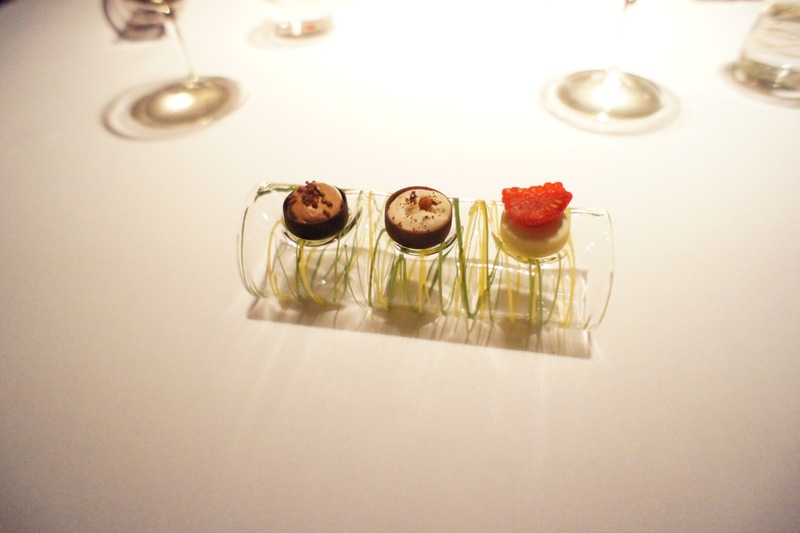 It was innovative yet well constructed with full of flavour. The sweet meringue was a good complement to the otherwise muted taste of the fried cream. The batter around the cream was very thin and crispy and did not taste oily or starchy. Amuse bouche was a simple affair of chocolates. 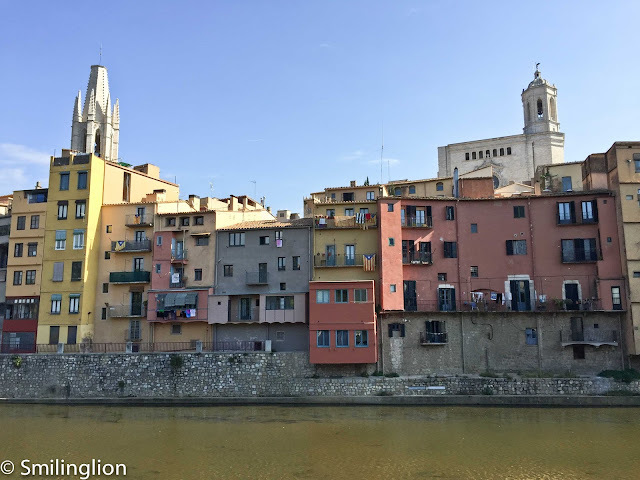 It was a fantastic meal especially considering that we didn't come here with very high expectations (given our inherent skepticism towards restaurants located right in the heart of the most touristy part of the town). Much of the restaurant and the meal here reminded us of La Calandre and we were glad that the Alajmo brothers didn't just lend their name to draw in customers but had a significantly positive impact on the ambience, decor and cuisine. Service here was excellent too and the staff was both professional and helpful. If we were to compare, the food at La Calandre was better but the location, ambience and sheer history of Quadri wins hands down. Final Thoughts: This was my wife's favourite meal on this trip. 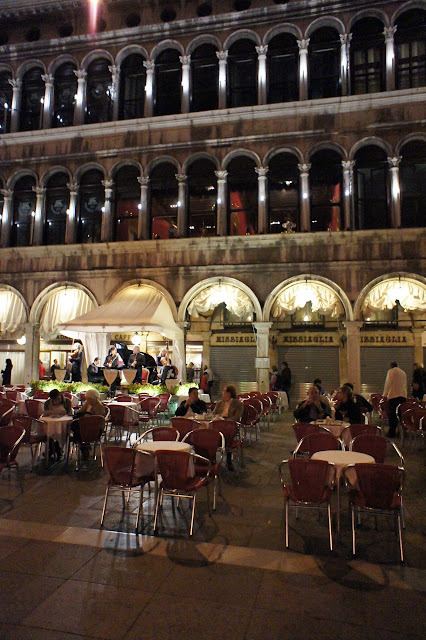 When you finish your dinner here and step out of the restaurant onto Piazza San Marco, you get to appreciate just how special the location of this restaurant is. 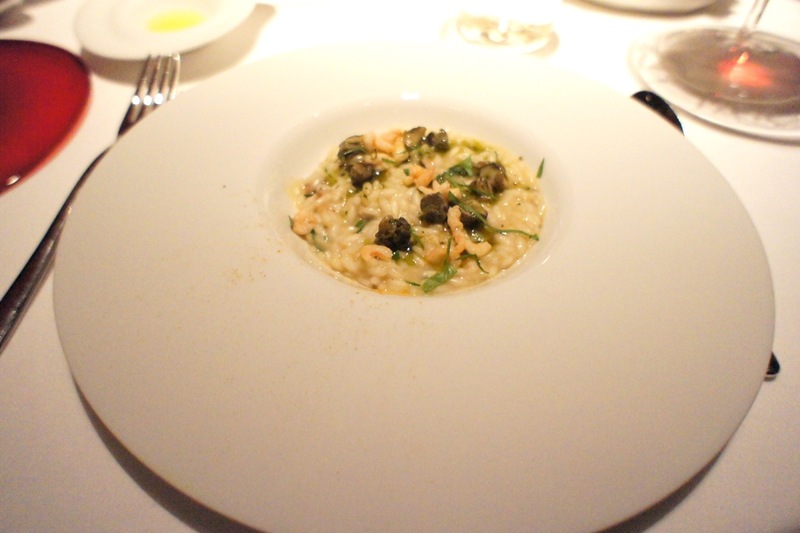 Fortunately, the food, service and ambience was every much as special. There was a very hip vibe about the place in spite of its sense of history and grandeur. If they keep this up, I expect this to be a 2 Michelin star restaurant in a couple of years at the latest.